The fifteen year career of D5090/24090 saw allocations to Eastern, London Midland & Scottish depots, including atwo periods in store. Built Crewe Locomotive Works (from batch 5076 - 5093). Shortened fuel tank & full size water tank (shortened fuel tank fitted later, circa 1970). Carried green livery with TOPS numbering. Retained green livery until withdrawn. Time between last Classified repair and withdrawal: 72 months (assumes last Classified repair in 1970). June 1960 to Cricklewood East (14A) on loan, made permanent July 1960. December 1964 to Willesden (1A). March 1967 to Stoke Division (D05). August 9th 1969 - to store. November 1969 - reinstated to Holbeck (55A). May 1971 to Gateshead (52A). August 1975 to store serviceable. February 2nd 1976 - withdrawn. 24090 was stored at Cadder Yard, then Carlisle from August 1975 until December 8th 1977 when it was moved to Doncaster Works and scrapped there during January 1978. Movement: 24007/14/90, 24108 14.00 Carlisle - Doncaster 9Z14 December 8th 1977. Photograph courtesy Glyn Weight, collection of Paul Roberts.Andy Parr. Green liveried 24090 heads a line up of stored/withdrawn Class 24s at Cadder Yard during the summer of 1975. Behind 24090 is 24014. Noted Derby Works March, May & June 1961. Noted Derby Works June 1962. Noted Eastleigh Works October 1965. Noted Derby Works August - October 1967 (collision damage repairs). Noted Derby Works June 1969 - January 1970 (to store, then repairs). D5090 was delivered from Crewe Works during June, initially allocated to March (31B) but quickly transferred onto the LMR as part of a larger transfer which included D5082 - D5093. 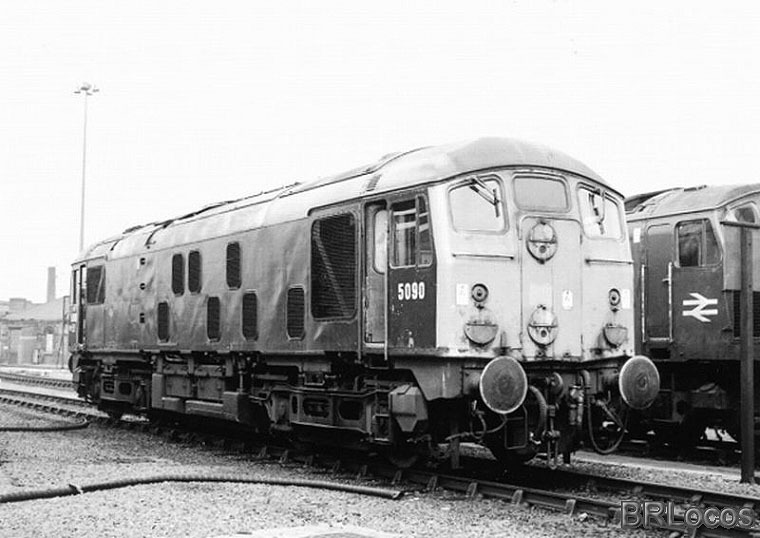 D5090 was toward the end of the last batch to be built at Crewe Works (D5093 would be the last delivered from Crewe). 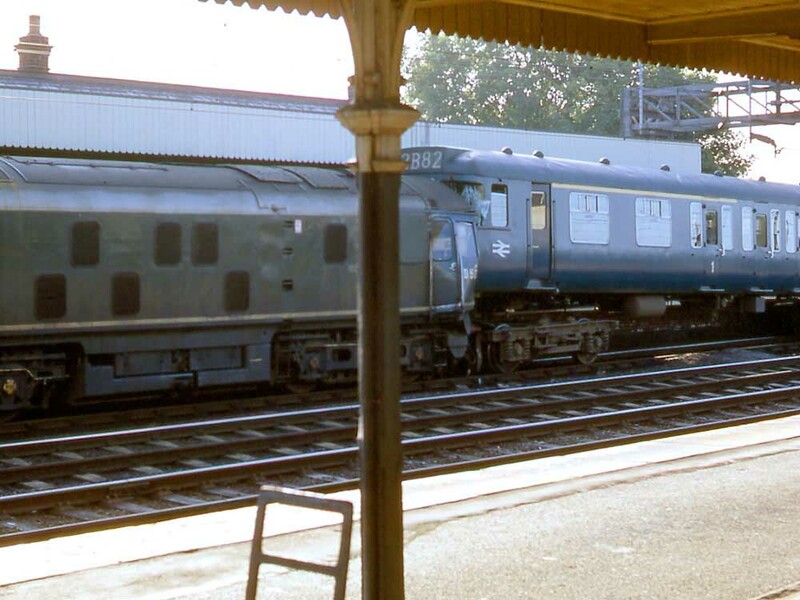 With the Type 2 order completed Crewe would then turn their attention to the BR/Sulzer Type 4s (later the Class 45s). Although this locomotive was part of Crewe's last Type 2 order, they would return here from time to time for scheduled repairs. D5088 - D5090 arrived on the Midland for crew training, one machine each being allocated to Bedford, Cricklewood and Kentish Town, working local parcels trips and the Moorgate services. They would be a very familiar sight on the St Pancras - Bedford line until the arrival of the Class 25/1s. By August (possibly earlier) D5090 had acquired small yellow warning panels, with curved upper corners and with the yellow panel reaching down to the valencing, covering the body stripe. D5090 was part of the large transfer of Class 24s to the Stoke Division (D05), D5090 made the move during March with D5085 - D5093. Another collision bedeviled the West Coast mainline, this time at Rugeley on August 5th. Here the 07.35 Stafford - Rugby, waiting at the platform was run into from the rear by a runaway Trentham - Lea Hall coal train. The impact lifted the rear coach into the air, the No.2 cab of the coal train locomotive, D5090, was badly crushed, requiring the assistance of the Fire Brigade to free the driver. Later in the day Class 40 No.227 moved the damaged locomotive to a siding at Rugeley. The wrecked diesel was later removed to Derby Works for evaluation. Photograph courtesy William Wright 'barkingbill'. August 5th 1967 - taken from a passing train, D5090 and a Class 310 remain locked in place. It would take a trip to Derby Works to sort out the damage caused to the cab. 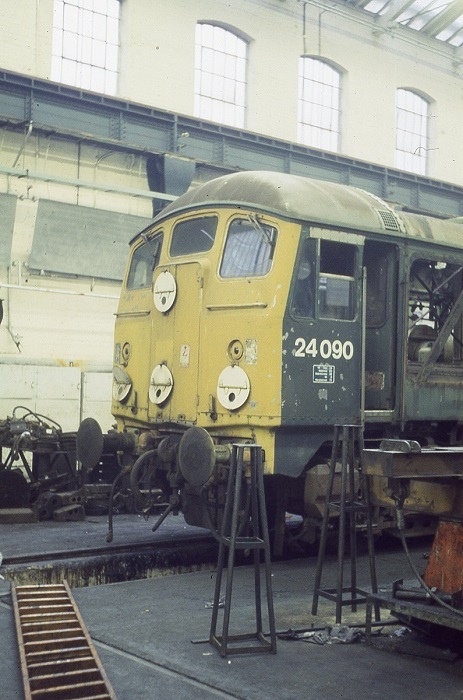 Interestingly the Class 24 still retains its roof mounted water filler cover. Condition August: green livery with small yellow warning pane;s, curved upper corners, full size water tank, shortened fuel tank, ridge sided sandboxes, mismatched bogie mounted footsteps (No.1 end three rung, No.2 end two rung), blanking plates fitted, hand/footholds present, engine exhaust in original position. Repairs were sanctioned and D5090 spent August through October at Derby Works under repair - despite the damage received the locomotive retained its green livery. Photograph collection of Tony Sayer A quick shot of the unfortunate D5090 at Rugeley on August 5th 1967. Its not too obvious in this view but D5090 still retains its curved roof mounted water filler cover seven years after D5090 was put into traffic. In general these filler covers were quickly removed, this must be some sort of record for a Class 24 to retain this fitting. It must be assumed that this was removed at Derby Works when accident repairs were completed. Due to a downturn in traffic 5090 was taken out of service and moved to Derby Works where it was officially placed in store during August. Fortunately for this machine and a number of others, a collision at Chester involving five Class 24s and a shortage of locomotives on the Eastern Region led to all but one of the stored Class 24s being reinstated during 1969. Holbeck would eventually become the new home for 5090 during November, although it would not be released from Derby Works until January 1970. Interestingly during its repair at Derby 5090 retained its green livery, whilst other recently reinstated examples, such as Class 24 pioneer No.5000 received corporate blue & yellow. Photograph courtesy Andy Parr. After its reprieve during late 1969 Class 24 No.5090 re-entered service at Holbeck, which is the location of this view, date unknown. During July 5090 moved to Gateshead (52A), then on to Polmadie (66A) in October. Shortages of stock at Haymarket during May affected the local services, receiving whatever motive power was available, the 14.15 utilised 5090 on May 7th & 26th. When Polmadie lost its locomotive allocation 5090 moved across town to Eastfield (65A) during March. 5090 was renumbered to 24090 during April. The mass withdrawals during the summer of 1975 included 24090, although it was initially placed in store during August at Cadder Yard before its transfer to Carlisle for longer term storage. It was noted at Carlisle, along with many others during October 1975. 24090 was officially retired during February 1976 and remained at Carlisle until early in December 1977 when it was towed down to Doncaster Works and finally broken up there in January 1978. 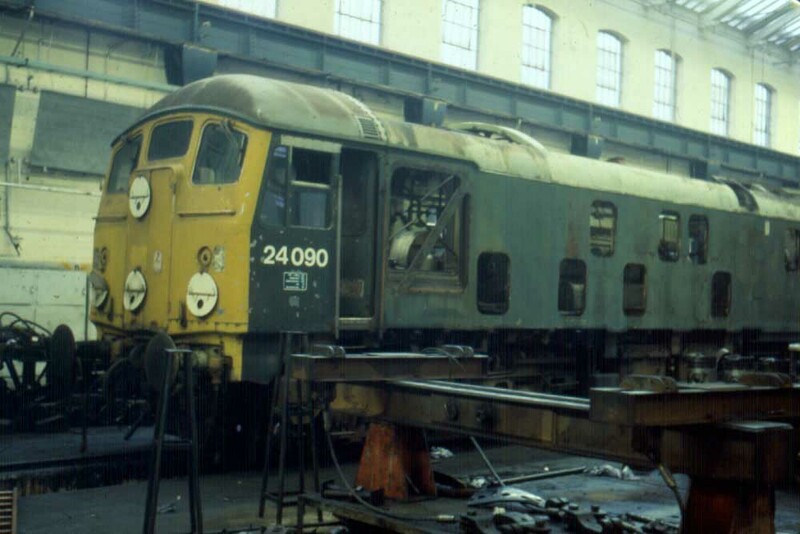 On a visit to Doncaster Works during the week of Christmas 1977 24090 was in the process of being stripped (see views below) prior to movement to the breaking up area. Condition final: green livery with full yellow ends, gangway doors present, no blanking plates, hand/footholds plated over, shortened fuel & water tanks, three rung bogie mounted footsteps, ridge sided sandboxes, no BR double arrow emblems - Lion & Wheel emblems on both sides. Doncaster Works on December 18th 1977. 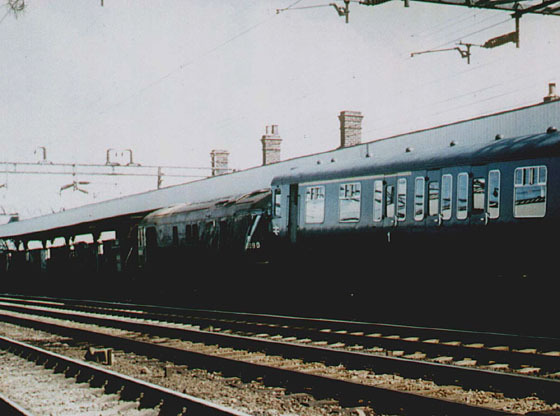 The cab view shows that the gangway doors remained in place to the end, the position of the blue star coupling codes indicates its last major repaint was at Derby. Also of interest is the metalwork repair above the cabside window. Doncaster Works December 18th 1977. The light coloured roof clearly indicates that the last repaint for 24090 was many years ago. This view was taken on a gloomy Sunday afternoon a week before Christmas in one of the darker buildings at Doncaster Works. I think this was a tight shot, hence the inability to capture the whole locomotive in the shot. When 24090 was broken up at Doncaster it was the only Scottish Region allocated Class 24 to remain in green livery at the time of the mass withdrawals during the summer of 1975. The Scottish Region in general were quick to outshop their long time allocation of Inverness and Haymarket Class 24s in blue livery. If 24090 made a visit to Glasgow Works after its arrival on the Scottish Region in October 1971 it either received only a touch-up in green, or perhaps nothing at all. 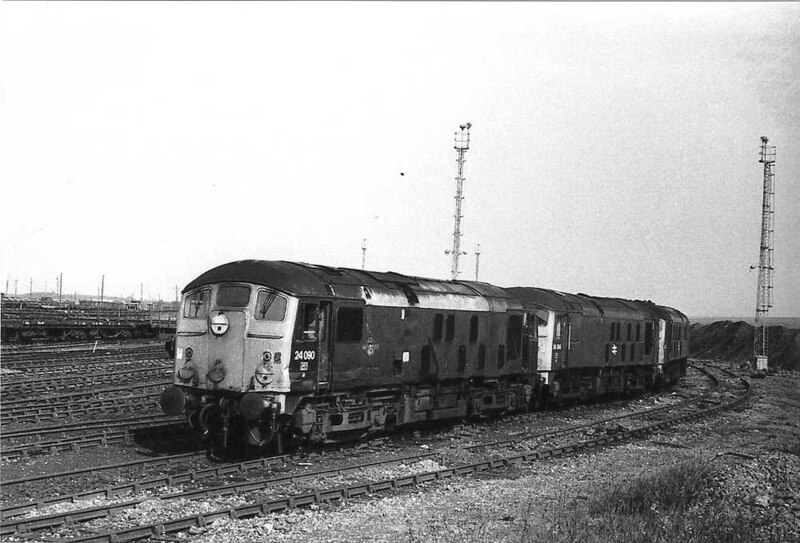 The LMR did send several of its Class 24s to Swindon for scrapping still in green livery including 24092 & 24136. 24092 had lost its 'Lion & Wheel' emblem for the BR double arrow symbol, whilst 24136 retained the 'Lion & Wheel' emblem to the bitter end. At the time of withdrawal 24090 was displaying a very faded 'Lion & Wheel' emblem on each side.